Oklahoma Connection | Thompson is a native of Oklahoma City, Oklahoma. 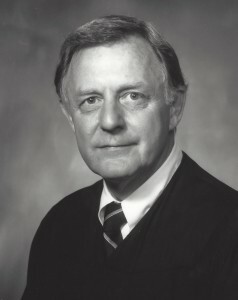 Ralph Thompson’s career as a federal judge began with his appointment as U.S. district judge for the Western District of Oklahoma by U.S. President Gerald Ford in 1975, becoming one of the nation’s youngest federal judges. Judge Thompson is also a published photographer, traveling to Africa and Antarctica. Oklahoma native Ralph G. Thompson graduated from the University of Oklahoma, where his grandfather, William Bennett Bizzell, served as the fifth president of the college, with his B.B.A. in 1956 and his J.D. in 1961. He served as a Colonel in the U.S. Air Force (1957-1960) and worked in private practice specializing in business law and litigation (1961-1975). He was elected to the Oklahoma House of Representatives (1966-1970) and was appointed as Special Justice in the State Supreme Court in 1970 and was named Chief Judge of the Western District of Oklahoma (1986-1993). He also began serving as an instructor at the Harvard Law School Trial Advocacy Workshop in 1982. Thompson has also served on committees of the Judicial Conference of the U.S. and served as judge of the U.S. Foreign Intelligence Surveillance Court. See pictures of Ralph G. Thompson and other media HERE.